The Theremin and the steel guitar are distinctive instruments, but have a commonality – they each can create a spectrum of sounds and effects that go well beyond what one has come to expect from them. Atlanta-based DfTaLAS, featuring Scott Burland and Frank Schultz on those respective instruments, are joined here by Colin Bragg on guitar and Blake Helton on drums, percussion and electronics. Rather than providing specific compositions or musical structure, this quartet meanders through two 26-minute slabs of modern dark psychedelia. Burland creates pulsing drones on the Theremin. Subtle, yet powerful, this base is built upon by Schultz’s steel atmospherics, and Helton’s disjointed percussion and effects. Bragg mostly provides plucked notes and a few moments reminiscent of electric solos. The group focuses on building walls of undulating sound, not unlike a mix between electronic music (ala Klaus Schulze), and 70’s Krautrock. But don’t get caught up in these Germanic comparisons – the characteristic repetition of those styles is eschewed for a musique concrete feel that slowly evolves between bright and dark, and between textures rough and smooth. Every once in a while you hear an album that is intriguing enough to come back to over and over. This DfTaLS effort is in that category. Each listening brings forth new features, aspects, observations. There is a lot going on with this challenging and enjoyable release. The rarefaction of the title of this collection—a lessening of density or pressure in a medium, as when a sound wave passes through air—is meant as an overall metaphor for the music it contains. 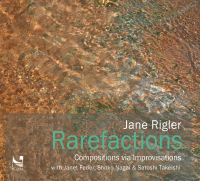 All of the pieces reflect flautist/composer Jane Rigler’s interest in the rarefied, individual sound properties of music at an elemental level, where the basic building blocks of material, gesture, timbre and density can be foregrounded and formed into independent structures of—often quite literally—breathtaking subtlety. The tracks, consisting of nine relatively brief pieces and one longer suite, were fully improvised by Rigler and a small ensemble made up of Janet Feder, Shoko Nagai, and Satoshi Takeishi, in various combinations and on various instruments. Except for one improvisation for Rigler on solo piccolo and one duet for Rigler again on piccolo and Nagai on accordion, which are presented as they were played, the performances were reworked by Rigler in the studio through editing or overdubbing in order to emphasize some aspect of the sound or to infuse compositional structure. In the solo pieces for herself Rigler shows how she can dig deeply into music’s formative factors to come up with compositions focused on micro-level phenomena. She takes, for example, the hollow of the breath as it explodes into and travels across the mouthpiece of the flute or piccolo, shucking off the skin of pitch and leaving the inner husk of air rushing through and around the metal tube. The multi-tracked Pulsar 1 for overdubbed piccolos plays with the microtonal discrepancies between the voices—creating a choric effect for one, as it were—while the similarly layered Pulsar 2 takes as its subject matter the low, resonating drones of bass flute, voice and electronics. The four quartet pieces Rewind, Externally Rarefied, Literally Rarefied and Rewound are essays in the timbral interplay of flutes, prepared strings, percussion, keyboards and electronics, often sparsely textured in order to allow each individual instrument to display the grain of its own voice. Sparseness—a rarefaction of performance–is in fact an overriding aesthetic value for all of these performances, which seem in the end to want to go beyond the physics of sound and to portray instead the coming into being of the music-bearing gesture against a background of emptiness. We’re standing outside the tiny, packed hotbox of London’s Cafe Oto during the interval following a two hour set of the most swinging and unhinged jazz you’ll be lucky enough to hear here on Earth. Bedecked in cosmic robes and Ottoman-style sequined hats – the garments of the space age – Sun Ra Arkestra are back in town playing their first show of a three-night residency, a show that winds up at 1am on a school night and leaves the crowd singing and dancing long after they have left the room. The following day, I sit across from their director, 91-year-old Marshall Allen, a student of the natural jazz pioneer Sun Ra and the inheritor of his Arkestra, who echoes their words. Composer Anna Thorvaldsdottir has released two albums in the last 12 months, both of great potential interest to fans of adventurous music, whether they start from a classical, metal, or even electronic background. Aerial, which appeared in November 2014, gathers six compositions for groups of various sizes, from duos to full orchestra (get it from Amazon). And in August, Thorvaldsdottir released In the Light of Air, on which two of her compositions—the lengthy, four-part title suite, and “Transitions”—are performed by ICE (the International Contemporary Ensemble).